UC Davis recognizes that many of its students use a name other than their legal name. As long as the use of a preferred name is not for the purpose of misrepresentation, the university acknowledges that a preferred name should be used whenever possible in the course of university business and education. Therefore, the university will permit any student who wishes to choose to identify themselves within the university’s information systems with a preferred name in addition to their legal name. It is further understood that the student's preferred name should be used in university communications and reporting, except where the use of the legal name is necessitated by university business or legal requirement. This service may be modified, changed, altered, or rescinded at the discretion of UC Davis. A preferred name is a first name (i.e., given name) that may be chosen to be used instead of legal first name. Students may opt to go by a preferred name that is different from their legal first name. This name will appear instead of legal name in the UC Davis Campus Directory and in other university records and documents. Some records, such as paychecks or financial aid, that require the use of a legal name, will not change to preferred name. However, whenever possible, preferred name will be used. The university allows you to specify a preferred name by editing the UC Davis Campus Directory. By updating your display first name in the directory, this will serve as your preferred name, and it will appear in your directory profile and other records. Campus departments are encouraged to utilize preferred name in their business practices, and campus technologists who need data access to preferred name can obtain assistance through sis.ucdavis.edu. When will my preferred name appear in university systems? Preferred names that were set in the UC Davis Campus Directory were first propagated into other campus systems starting with the Spring 2014 Quarter, on March 27, 2014. Once you set a preferred name, allow 48-72 hours for it to be displayed in other systems. No. Initial implementation will begin in the Spring 2014 term and its use will expand as other campus systems or departments express interest in utilizing preferred name. Legal name will always be used in business processes that require the use of the legal name, such as for payroll records, student transcripts and financial aid. 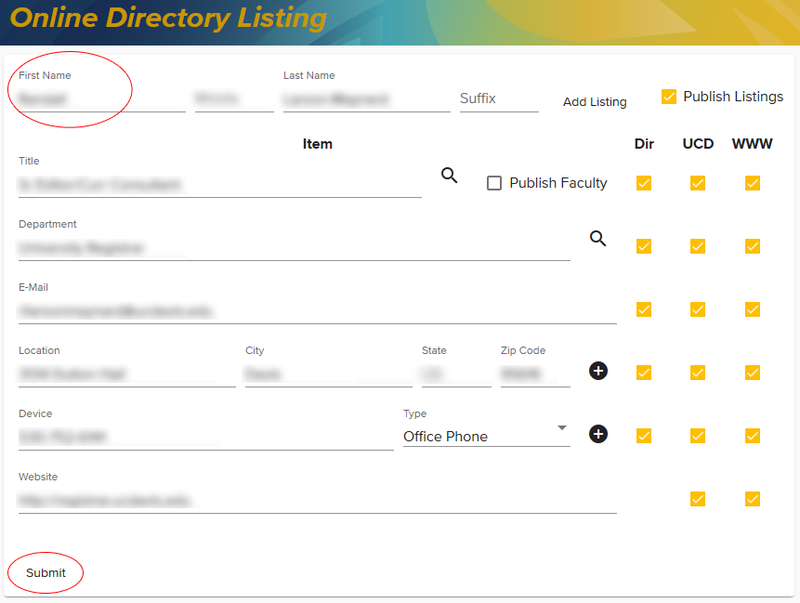 Using the UC Davis Campus Directory, edit the Display Name First field to set your preferred name. This change will propagate to other systems that use the preferred name within 48-72 hours. No. Preferred name only applies to your first name. Although you may edit your middle and last display name in the UC Davis Campus Directory, these names will not propagate into other university systems. If you would like to change your middle or last name on your university record you will need to change your legal name. Students may determine and designate a preferred name that they want to be known by in university systems. The University reserves the right to remove a preferred name if it contains inappropriate or offensive language, or is being used for misrepresentation. Students who wish to change their legal name must supply supporting legal documentation and complete the Petition for Name Change on University Record online webform or paper form with the Office of the University Registrar. Possible 24-36 hour disruption of your email service as the email servers transfer your messages from the old login name to the new login name. If you are certain that you still wish to rename your current login please contact IET by phone at 530-754-4357 between 7:00 a.m. and 9:00 p.m. (PT), Monday-Friday. How do I get a new AggieCard with my preferred name? After setting you preferred name in the UC Davis Campus Directory, please allow 48-72 hours for your preferred name to propagate to the Student AggieCard system. Request a new AggieCard at the AggieCard Office in 253 Memorial Union. How much does a new AggieCard cost? A $15.00 replacement fee will apply. This service is student focused and although employees are able to change their display name in the UC Davis Campus Directory, these names do not propagate into the student information system. Although SmartSite will be modified to utilize preferred first name for employees as well as students, employee names are maintained in the campus’ Payroll/Personnel System (PPS), and legal name is used in this system.